Material;lace,rhinestone. All pictures are for illustration purpose only and Colours may vary slightly. Import Duties. You can follow below process to chontact us. 1 pc headband. Le 02-nov. -17 à 20:16:06 Paris, le vendeur a ajouté les informations suivantes Weight：App 22.1g. Crystal chain length: app 16.5cm/6.5". Total length: app 25cm/9.8". Material: crystal. Two piece black and tortoise shell colour tooth design headband hair accessory set. 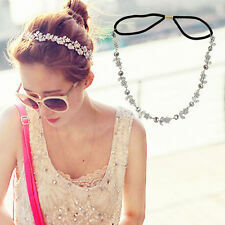 Two piece black and tortoise shell colour tooth design headband hair accessory set. Perfect for busy lifestyles, an essential accessory for everyday use. Great for curly or straight hair! Approx size: 2cm width. 2.5cm White Satin Covered Alice Band Headband Bandeau Hair Band Ladies Girls No Teeth Hair Accessories UK. Satin covered plastic alice band. SIZE: 18 15cm/7.1 5.9in. Quantity: 1PC. Material: Alloy. Color: Black. occasion：daily life. Special Design and fashion. Flower lace hollow pattern. Ideal product for hair decoration. Elasticity Band Length: About 16cm /6.30". Color:Show as pictures. Material: Cloth. Unique and gorgeous design. Beautiful and attractive. Material: alloy. 1 Hair Band. 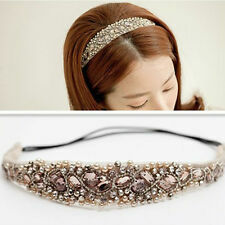 sweet style hair band make you energetic;. color:sent randomly. size: Width about 1.2 cm;. very cheap and high quality;. make you more charming and attractive;. 2 headband tresses brunes. - 5 pinces noeuds noir. White & light blue cotton sponge strech fabric with embroidered iconic crocodile on the side. Le 15-avr. -19 à 09:13:55 Paris, le vendeur a ajouté les informations suivantes Size: 45CM/17.7". Gender: Adults and children. I gift either the Brown Hair Pin or the Sally Cup Coasters if you buy this item. Special design and unique Style,Cute and Fashion.Easy to wear.Acrylic kids girls knitted crochet headband, fashion and cute.Stretchy, comfortable to wear. Item Type: Headband. Material: Crochet. Je vous propose ce lot de 5 bandeaux. Si vous avez des questions n'hésitez pas Emballage soigné, envoi rapide.